Michael McFadyen's Scuba Diving - The Gutter Sponge Gardens The Bass Point Reserve is one of a number of dive sites in the Shellharbour area which are regularly dived by Sydney divers. Located only 105 kilometres south of the centre of Sydney (no more than one and a half hours drive from most spots) on the southern edge of Wollongong, Shellharbour is very popular with divers, especially those from the southern and western suburbs of Sydney. 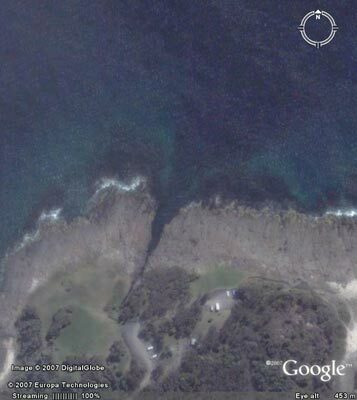 The most popular dive sites are found in or off this reserve which is just to the south of Shellharbour township. The dive sites include Bushrangers Bay, The Gutter, The Arch, The Holes, The Gravel Loader and Beaky Bay as well as the remains of the ships SS Cities Service Boston, Alexander Berry and Our Own. One of the great things about diving at Bass Point is the fact that the reserve is an excellent place to stay for a whole day, doing two or even three dives with a barbecue or picnic lunch on the grassy lawns. Note: no barbecues are provided but there are picnic tables. Also note that since December 2001 the council has been closing the whole Bass Point reserve (as well as some parts outside) during periods of Total Fire Ban. Ridiculous!!! (Note that I am a professional bush fire fighter so I think I can comment on this decision). This dive is a variation on the normal Gutter dive. It goes to the sponge gardens which are located far further north than you normally would go. You should not linger as you head out to the Sponge Gardens. On the way back you can go slow as you will have a better idea of how much air you have left. As you go the wall on the left becomes a more gentle slope and it is a bit barer. It has some sponges and sea squirts on it and generally there are many bulleyes and ladder-finned pomfrets. After a 100 metres or so there is a small canyon on your left. The depth here is about 18 metres. Keep following the wall. The natural way to go is pretty clear and you follow the slope till you come to the end of the wall. This will take you less than 10 minutes. From here, swim due north for about 40 metres. This will take you across some sand with large and small rocks on either side. The depth drops to 20 metres and soon after to 22 to 23 metres. 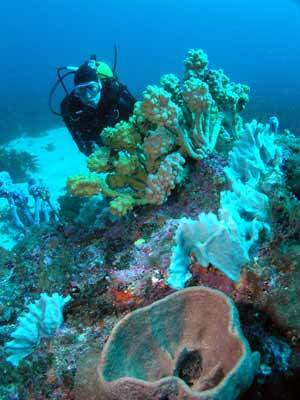 When you encounter the sponge garden, zig-zag around and look at all the rocks. There are many beautiful scenes. 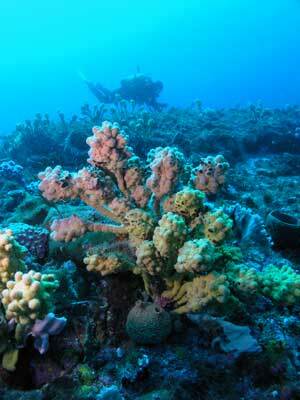 Most of the marine life are sea tulips, many different colours. There are also a few small gorgonias. 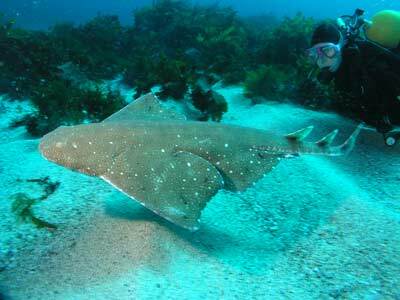 I have seen a alrge bull-ray in this area and in mid-2006 I saw a small angelshark. Cuttlefish are also commonly seen. I would head east from where you first hit the garden. After about 25 to 30 minutes you will probably need to start back. Take your time unless you have not much air left. Head south until you hit one of the Gutter's walls. Follow this back to the main section of The Gutter. You may see some sea dragons as you go. Gradually the depth comes up from 22 metres to 14 then 8 before you enter The Gutter where it is five metres. When you are in three metres, surface and find a good exit spot (in low tides, on the point, high tide further up the gutter). It is a fairly easy exit. 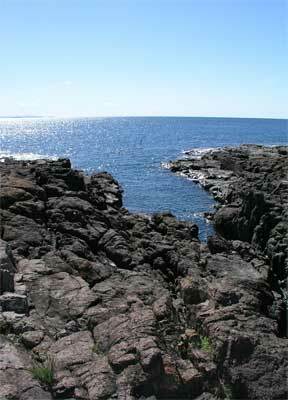 This dive site is protected from southerly winds and even in gale force southerlies, you can dive here in comfort. However, due to the depth and distance from shore, I would not recommend this for inexperienced divers.